Repeated from part I: I distinctly heard Tom say: “There you are big boy, I hope you’re a good swimmer.” Keith responded, “Not really, I can dog-paddle alright but I’ve actually never swam much at all.” With that he kicked off his boots, stripped off his socks and tee shirt, waded into the shallow water and set off for Mississippi. Looking west across the Mississippi River from a point on the eastern shore, just south of the Old Vicksburg Bridge. Special thanks to use this photograph go to Janie Fortenberry, Southern Accents Photography, Vicksburg, MS.
Keith’s entry into the water caused Skip and Jim to put aside their rock skipping fun in order to stand and watch along with everyone else. I suppose everyone was watching with the same sense of disbelief that I felt. Daylight was waning fast. As Keith progressed farther and farther east a view of him became more and more difficult, the farther east he progressed, the more our collective feelings turned closer and closer to a sense of foreboding – Tom included. It pretty quickly became clear that Tom was a worried man, for he had already uttered a statement that I will paraphrase something like this: “I believe the son-of-a-gun is gonna try to do it.” He said it in a nervous, telling kind of way though. Ultimately he was the one in charge and therefore, at least to the company, responsible for all of us. Because of that there is little doubt that he was questioning his judgement about allowing such an activity to go forward in the first place. He was obviously wavering between letting the activity continue, probably thinking Keith would surely turn back, or to try to call the thing off. Keith, in the meantime was getting farther and farther away. 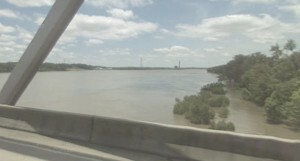 The water on the western side of the Mississippi is shallow for a long distance offshore at the point we were located north-south along the watercourse. Because of that Keith had been able to wade a very long distance. With the great distance and the closing darkness I never saw him break into an overhand stroke and to this day don’t know if he ever did. For that matter, I still don’t know if he was even capable of swimming that way. Skip, as I recall was the first to tell Tom that he had better do something to get Keith back before he was sucked into the main channel on the east side of the river. Though Skip was subordinate to Tom he was perhaps unofficially, but certainly recognized by all to be second in command. His directive was enunciated in such a way that Tom had to have taken it as good advice, but with an underlying tone akin to a warning. At this point Keith was only a small black dot far out into the Mississippi, and though not yet in the main channel, he had drifted considerably downstream. It was now dusk dark, it wouldn’t be more than five or ten minutes before everything was going to be black on the surface. 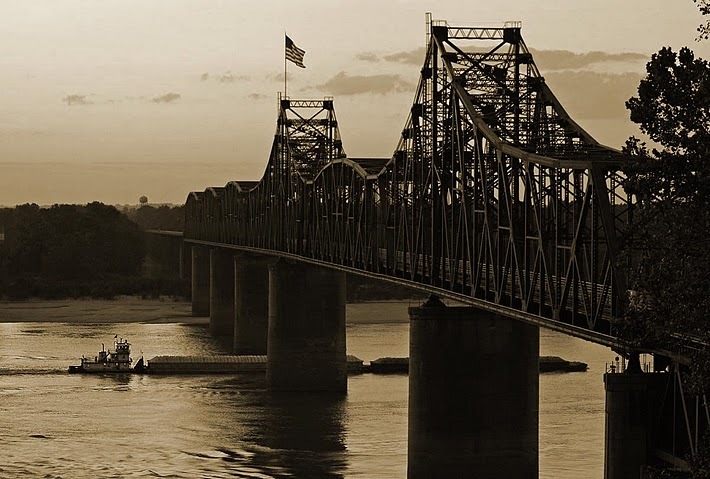 Barge traffic and swift water were the real dangers that Keith was headed towards – and he didn’t have the first idea about either one of them. Upon Skip’s advice Tom pretty quickly decided to give up the project. Without any discussion at all he turned to me and instructed me to run down the sandbar and call him back if I could. And to tell him that he could have the money by the way. I could holler pretty good and I was as swift as any on the crew. So run I did. 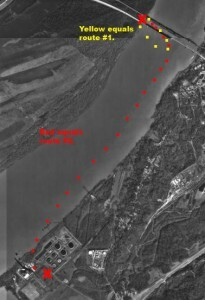 I ran, hollering as I went, all the way to the south end of the sandbar which was located just about where the south edge of the I-20 bridge is in this day. I hollered and hollered and hollered some more. It seemed useless. Keith was no longer in view and possibly as much as a half mile away. I trudged wearily back up the sandbar and reported that I had done all I could but it didn’t look too good. Tom made a decision for all of us to travel to the east side of the river and do our best to search along the riverbank in case Keith had made it across. We piled into both vehicles, backtracked westerly along the dirt lane until we could get on US 80, then traveled to the east side of the river and turned south on a secondary road that more or less paralleled the river. Upon arriving some distance south of the bridge we were dispersed individually at rather wide intervals to begin our search. The place I tried to gain access to the river was as steep as any hill I have ever been on, and it was thickly covered with brush, small trees, big trees, thorns, dead-fall of all sizes, and anything else you can think of that one can stumble over – in pitch dark. I didn’t have so much as a pack of matches to see my way. I got as close to the river as I could, stumbling, falling and blundering my way along hollering for Keith. I am sure all of the others encountered the same difficulties. After awhile we were all summoned back to the road somehow. Our search had been fruitless, something else had to be done. A plan was laid by Tom and Skip for Skip to travel to the motel we had registered at upon our arrival in town earlier in the day in order to standby for a phone call in case Keith made landfall on the Mississippi side and was able to get to a telephone. If that event did occur Skip was to call Tom by radio. The case being that both vehicles were equipped with Motorola radios. One of them may have been a permanently mounted kind; whatever the case, at least one of them was of a portable design that was sort of the cell phone of that day. They were the size of an ammunition box and worked quite reliably through a repeating tower system the company maintained. Because of this, Skip was able to standby in his motel room for a telephone call and also to communicate with Tom by radio. After Skip set out for the motel, we all piled back into the wagon and headed back to the west side of the river on the off chance that Keith had in fact heard my calling and returned to shore. We eventually arrived at the western shore, got out of the car and meandered around a little bit calling for Keith. It was not to be. He was not there. With that, Tom announced we would travel back to the east side and continue our search – this time farther south than our previous search. This on the theory that we hadn’t properly allowed for the swift current of the river. This photograph is a "Google Maps Street View." The view is looking south from a point on modern day I-20, almost directly above where we stood on the small sandy beach alluded to in the story. The beach is obscured by high water in this view. It was from this vantage point that we observed the faint outline and lights of the industrial complex on the eastern shore. The facility can be identified here by the stack and rectangular structure just to the left of it. It is about 3-3/4 miles distant. We surmised (though incorrectly) that the river took a sharp bend to the west, and that it would be that point that Keith would most likely make landfall. We could see a cluster of floodlights and other general lights of what appeared to be a large chemical company or some kind of industrial complex that we estimated to be two or three miles south on the eastern shore. It was there that Tom announced we would search. We all got back into the car and headed to the east side again. Tom’s bet had not shut Keith up one bit. As we were riding toward the motel we began to relate our side of the story to him. When we got to the part telling him about how we had gone back and forth across the river, how we had tried to call him back, and that he could have the money and so on, he never missed a beat – he quickly informed Tom that he should be paid double because he had heard me calling, and that he did swim back to shore. When he discovered we weren’t there he had thought he was hearing things and had gone back in and swam all the way across, stopping only to tread water in the main channel while a long train-of-barges went by. And oh by the way, he went on, nobody bothered to tell him about the barges – that those things throw up big waves, and that he was put under several times and thought he might drown before the thing got past him. Keith's routes. Route number two is nearly four miles long. Keith Wright, in effect, swam the Mississippi River in the fall of 1966 – twice. And he did it at night. We took his boasting a little more seriously after that. Keith Wright lost his life in a high speed car crash a few years after these events while attempting a “cannonball” type run along Alabama Highway 52 from Helena to Bessemer. He was attempting to win a bet for a small sum of money. Tom McCray has been retired from Southern Natural Gas Company for many years and still lives in the Birmingham area. Skip Gentle is also retired from Southern Natural Gas Company. He too lives in the Birmingham area. He spends his days with his wife and their extended family including daughters and granddaughters of which he his extremely proud. His passion is helping carry out the good works of the Knights of Columbus organization of which he is designated as a District Master on the roster of Alabama State Officers. Jim Brazier, who was once recruited right out of high school by a major league baseball team passed away in 2008. He was sixty-eight years old. At last account Mark Gilliland was living in Texas. *A lot of worried conversation went on between everyone in the car on this second trip to the east side of the river. I suppose it is for this reason that I did not hear radio communication that went on between Skip and Tom sometime between the time we left the west side of the river and the time we pulled up to the guard shack. It was only through recent correspondence with Skip that I now know that Keith had in fact called him at the motel by land-line from the guard shack and he had in turn called Tom by radio to tell him where we could pick him up. There is also the possibility that I heard the radio communication at that time and had simply forgotten it. I thought it more important to relate the story to you from the point of view and with remembrances that I have held for many years, rather than to introduce recently discovered information into my long held memories only to accommodate a purely chronological telling of the story with facts that I may not have then known or had long forgotten.